Such a misrepresentation in the license agreement spells real trouble for Rossi & co. This assumes that the possible misleading statement was in the License Agreement. That has been a common error. It was in a document signed by Johnson about two years after the License Agreement was created. It was probably included accidentally with Rossi’s Exhibit filed with his Complaint. There was very likely a misrepresentation there, by the preponderance of the evidence (POTE) at this point. Really, JMP was Johnson, see The owner of JM Products and Does Rossi’s “customer” matter? Perhaps so. But that assumes that JMC wasn’t owned by an entity formed in the United Kingdom at the time of entering into the license agreement. Circumstances can certainly change with time. Again, the error about the License Agreement. The Johnson certification was two years later. This was the sequence, as described in the pages linked above. JMC was incorporated with Johnson as sole incorporator. A few days later, Rossi proposed the sale of power to JMC. A few days later, the trust was created that is now disclosed as the only other “interested party.” A few days later, agreements were being signed with IH. The trust is a Florida entity, almost certainly, basically some papers held by Johnson, the trustee. A trustee has title to any property and full control, but is obligated to manage it for the benefit of the beneficiary. The trust was clearly created to be the owner, to allow Johnson to claim that it wasn’t him. There was no operating manufacturing company. The saving scenario I guess would be that the parent UK company wanted no part of this circus and divested itself before this statement and JMP/Fabiani agreed to keep them out of it. …but I guess we’ll have to see what else comes out. If Rossi & co. were acting in a fraudulent way, at least when it came to the 1 year test, then there will be many more indications. Indeed, a reach. There was never a parent UK company or “entity.” If there was, why was the trust formed? … and there are other indications, many. Or maybe the beneficiary lives in the U.K. The appearance is clear: this was all set up to create a “customer” so that Rossi could have full control. “Owned by an entity formed in the UK” and “having no parent corporation” are not necessarily contradictory. For example it could be some foundation which is based in the UK and which owned/owns the company. Or, as someone suggested, the ownership could have changed meanwhile. Every company is owned by some legal entity, the question is then if there was a connection to the UK, and if not, is it relevant. Pekka is correct. For most purposes, Johnson was the owner of JMC, but pursuant to a trust with Johnson as the trustee, and both were formed by Johnson, a Florida attorney, and, what a coincidence, the President of Leonardo Corporation! All this is going to lead to more discovery by IH, as soon as the 3rd Party MTD is dismissed, as I expect. Any owners would have a financial interest in the outcome which are listed in the same document. The only possibility, really, aside from the individuals named in the conspiracy is Platinum American Trust. So I guess maybe Platinum American Trust was formed in the United Kingdom and named Henry Johnson its trustee. As a trust it would not be a corporation, so there’s that. Designating Johnson as the trustee would allow them to keep their anonymity. So maybe JM after all? We need to find out what we can about this PAT entity. Is it just some shell set up by Henry Johnson to make things look more real to IH? Is it UK based? Who are the owners and officers? Is there any public info on it? Some light googling turns up nothing. EDIT: and who is Francesco Di Giovanni, beneficiary of said trust? We will see some speculation here, the usual. The trust was formed a few days after Rossi suggested the agreement with JMC, a few days after JMC was incorporated by Johnson. Okay, I give, which one? Same one that publishes the “Platinum Metals Review” and hosts the annual Platinum “fix” dinner in London. There are 58 Francesco Di Giovannis on LinkedIn. Most are in Italy. This is the one JustKidding was just kidding about: LinkedIn profile. “Obviously,” yes. LOL! Not impossible: Di Giovanni was visiting Florida in 2014, and was in Johnson’s office, and this plan was hatched…. Thermocold is not a chemical manufacturing company, at all. Nor would they be likely to be using platinum products. Nor were they in the U.K. It is not clear that it really matters who Mr. Di Giovanni is. The basic fact here is that the owner was a trust totally controlled by Johnson as trustee, owning a company totally controlled by Johnson. If this was not a clear violation of the disclosure Johnson signed, it was nevertheless misleading, because the goal of those disclosures was frustrated, and the owner was not actually independent, functionally, from Johnson and Rossi. Had you considered the possibility that they recently separated from the parent company since the test so that the parent company can just walk away. That is certainly a possibility, but I don’t think even you believe it do you. It is apparent that the trust was created to be the owner of JMC, back in 2014. Avoiding the obvious gets Rube Goldberg here. So, what about the three reactors that were being built for the parent company? Another fabrication? This quickly became a sign of triumph for people that thinks that Rossi is a con man. I certainly hink it does not look good, and I hope this does not means what It seems at face value. But it does indeed look very bad for Rossi, at least from my point of view. Curbina is a lenr-forum.com moderator. No response appeared. What the hell kind of games are being played, here? This is getting pretty absurd. It’s been more than five years, now, and we’re still awaiting a single entity to come out and say, unequivocally, that it works and that they are using it. We were hoping for the parent company of J. M. Products, and, now, they’re claiming that is doesn’t even exist? This is starting to sound like a Kafka novel, and it’s really starting to piss me off! barty is a lenr-forum.com administrator. Either that (a company coming out and saying it works), or an entity coming out saying that it doesn’t work. One of both it must be. But even IH is not clearly saying that Rossi has nothing. They don’t say that because they don’t know that. From their claims, what they know is that with some years of effort, they were unable to find excess heat using Rossi technology. That he doesn’t have anything is only one possibility, though some may think this likely. They also claim that the Doral “test” was a sham, fraudulent. They also suspect that the Validation test in 2014 was likewise fraudulent, and they cast major doubt on the Lugano test, which was already in trouble due to serious — and obvious, in hindsight — errors. This is strange, because IH could end this (very expensive) curt case by simply providing evidence that Rossi has nothing and faked all data. If barty thinks they have not provided evidence, he has not been paying attention. He’s looking for an extreme that might never be possible. The case does not hinge on whether or not Rossi has “anything.” It hinges on two basic issues: first, was the Doral demonstration/sale of power a “General Performance Test” under the Agreement as amended? If not, end of Rossi’s case, but IH still would have a countersuit running. If so, then the second question does become if the Plant actually performed as stated by Penon, and essentially whether it generated a megawatt 24/7 as required, i.e., with allowed exceptions. The fraudulent representation evidence relates to the first issue, because if there was fraud involved in setting up a GPT, that could invalidate it. But the GPT claim of Rossi is in trouble even without any fraud claims, because it appears that there never was an explicit setting in writing of the test start date, as very clearly required in the Second Amendment that allowed postponement. It looks like Rossi tried to do an end run around that requirement, at the same time arranging for the test to be under his complete and personal control, which defeats the concept of a GPT. Actually, most delay has been introduced by Rossi. The trial date was set long ago, though, and I don’t know that this date will be missed. See 0023-0_order_setting_schedule Trial set for period of 6/26/2017… Rossi’s Motions to Strike and to Dismiss were ill-advised; his discovery requests have been a massive fishing expedition, looking for evidence that he didn’t have when filing, it appears. We already know of evidence that the Doral plant wasn’t generating a megawatt, most notably the lack of equipment (which would be obvious and noisy) to dissipate a megawatt of power. IH does not need, at this state of the case, to disclose publicly all the evidence they have (but they must disclose it to the other side in discovery). They have full rights to not only the original IP, but also Quark-X, or any other “competing technology” Rossi develops, based on the Agreement. Nonpayment does not cancel the agreement, Rossi’s declaration was legally meaningless. (Unless the agreement provides for that, and it did not.) Rossi could still arrange a genuine GPT if he wished, and if IH refused, he could demand specific performance. I.e, a court could order them to set a date, under reasonable conditions. Rossi sold those rights for $10 million plus the opportunity to earn another $89 million, which still exists. And if he actually did it, IH would gladly raise that money and give it to him, I’d predict. Well, whatever the case is, it’s going on too damn long, especially since, if this is the real deal, it could be revolutionary. This is generally the case with LENR. Several years ago, I started writing about Plans A and B. Plan A was that an inventor or innovative company comes up with a product that hits the market. (And, of course, that it works!) Plan A is really cool. I don’t need to do anything, the work will be done by someone else. Unless I can invest in Plan A, an exception. I am not in a position to do that, no matter how good it looks! I saw that Plan A, as applied to Rossi, was dangerous, for all the obvious reasons! Even if his devices actually work, there are a million ways to fail. So we needed an alternate plan. Plan B is to establish the reality of cold fusion by cleaning up the research, doing what has been needed for 25 years. Much of this was already done, but … not well presented, and, perhaps due to funding shortcomings, was not as thorough as might be desired. So…. write about this, and that, I could do, and did. Plan B is working, the basic research has been very adequately funded and is being done. Probably, IH’s adventure with Rossi is over. Effectively, the “crushed the tests.” That is, they did whatever they could to make sure, one way or another. So IH, funded by IHHI, the parent company, is now facilitating basic research, for the most part. They may or may not have any investments in commercial efforts. They aren’t saying, but we know about the blue-sky research support of Kim, Hagelstein, and I don’t think the Letts support is secret. I assume there are others. Certain scientists have ended up with stock in IHHI, which is a clue. There has always been something suspicious about this ‘customer’. Rossi would have had a very strong case if this ‘customer’ were a real company that could testify the amount of heat delivered. Indeed. He still would have had to obtain explicit consent for the start of the GPT. The apparent lack of genuine consent, where it was explicit that this needed to be through a document signed by “all parties” (which would include Ampenergo), is the weakest part of the Rossi claim, and it is fundamental. My opinion is that without that consent, the Rossi claim is dead, his case is not winnable. So he is scouring through as many as 100,000 pages of documents disclosed by IH, looking for a smoking gun. What do we know about this ‘customer’? Let’s look at each point. I am always suspicious of knowledge that is claimed without sources. Rossi says things that are readily misinterpreted — or that create “plausible deniability.” I.e., “I didn’t mean what you thought!” Here, no sources are given. I will react based on my memory, which can be flawed. If I think of them, I’ll cite some sources. Here on this blog, it’s easy for me to find and cite the Rossi v. Darden case pages, which are reasonably authoritative once one understands the difference between claims and evidence and conclusory statements. 1. AR met him as another client of his attorney. He said that. We have a probable owner, a trust, which was created after Rossi proposed the move to Florida, which was after Johnson incorporated JMC (which was renamed JMP later). The trustee of the trust is Johnson. It is not impossible that the beneficiary was met in Johnson’s office. However, this is clear: JMC was not an established chemical manufacturing company needing heat. As Gerard comes to, the Rossi proposal comes before the “owner” appears. From all the evidence put together, this was planned from the beginning, when Johnson incorporated “J.M. Chemical Products,” and the intention was likely to hint affiliation with Johnson Matthey. It all happened very quickly, within a few weeks. 2. After the test the ‘customer’ was identified as JM products. 3. Now we know JM products is not related. J.M. Products was the “customer.” That’s clear. 4. During the test AR said several times that the ‘customer’ was satisfied. 5. After the test AR said that the ‘customer’ would buy three of these plants. I think he wrote that, also. What does this tell us about Rossi Says? By the end of the “test,” Rossi knew that he was not going to be paid. 6. AR is rather secretive about the manufacture/status of these three plants. It is unlikely that any are being built. Rossi built one plant in 2011, I think it was. It was then the subject of various rumors, and it ended up with IH — it is what they bought for $1.5 million, and then it was at the Doral plant for backup. Now, as a sale of power, backup would make sense. As a GPT, it makes no sense at all. In a GPT, it is the Plant that is being tested, not the general technology. However, this might be moot. We know that the Plant did not operate at full capacity all the time, according to the JMP invoice requests. I’m not seeing that the definition of the GPT was actually followed … but it was unclear, and it could have been considered, looking at the simple language, “success” if with 10 watts of input, the device put out 60, because there was no power specification, only COP, a Rossi obsession. 7. IH has never met the ‘customer’. I would suggest that AR and ‘somebody’ joined to establish a temporary company that would manufacture something using the heat or (more likely) dump the generated heat, just to speed-up the last phase of the contract with IH. (AR has said that IH didn’t come with a suitable candidate, so he organized it himself). AR said also that the ‘customer’ measured the delivered heat. If this temporary joint venture is indeed the case and the heat is dumped, then it weakens AR’s court case, because the heat data can be manipulated. If the ‘customer’ really made heat consuming products, then the case is stronger if the required heat can be calculated from the products and independently verified. He noticed. That possibility is plausible. There may have been an intention to use the heat for manufacturing something, but they were not really in the chemical business and never got around to it. JMP was the customer and provided invoice requests stating that these were the power delivered. However, they were impossibly round numbers, this was not measured. It was almost certainly taken from Rossi Says. Unless perhaps they were making water from ice (which would have absorbed the entire megawatt, but with a lot of ice coming in the door and a lot of water going down the drain), most of the heat ends up in the environment. Endothermic reactions are not generally efficient. However, any products actually being sold from JMP would be a strengthening of the defense of JMP against the fraudulent inducement claim. They will be awnsered in time . What i would do is try and keep a lid on the whole affair until court day no need helping the other side. Which side is the “other side”? And how does discussion here help or hurt the parties? If discussion brings out something that was missed, that can be established with evidence in court, wouldn’t we want that to happen? Do we care about the truth? If you read the mail from AR about finding the customer, a masterpiece etc and to go on like IH did. For me there’s only one conclusion, IH knew what was going on and agreed with it, maybe they hide now behind laws and contract lines but you just don’s invest this kind of money without fact checking. They just let it go for what ever reason. It is probably dirty from both sides, or not and AR did not show his cards. I think the story isn’t over, there are just to many things that just are not logical. Life is not logical. And investors like IH are very unusual. Most of us have never met people like them, in spite of what some here claim. For them, this was not a very large sum of money, all things considered. They knew it was risky. My sense is that the Rossi investment, and how they handled it impressed Woodford, so their own $20 million (the stock offering, probably all spent on the Rossi agreement — $11.5 million — and the rest on attempting to develop the technology, then turned into $50 million, and Woodford knows that this will all be spent, that more investment will be required. Maybe a lot more. This is LENR, which, if it can be made practical — the huge question, not reality — could be worth a trillion dollars per year. While their lawyers have claimed technicalities, so have Rossi’s lawyers, and lawyers do that. The substance, however, of the Agreement laid out certain requirements and it is looking like Rossi not only did not satisfy them, but attempted to trick IH. Did IH realize that? Maybe. It’s not impossible at all. But what then, what would they do? I suggest that what they did may have been quite a decent choice. I would have had them invoice JMP for the roughly $300,000 in power reports. I think their attorneys told them not to. Done properly, though, this would have had some great effects! Among other things, tracing money is pretty easy for an operation like JMP! I think you nailed it, I think IH thought that Performance Test as arranged by Rossi was playing out to their advantage. With $89 million at stake they knew what was happening next door with a pin-hole camera through the roof. I think we are seeing both sides playing us, the lawyers and the COURT. But of the course, their is always the ‘greater good’ and that is in Rossi camp. Highly unlikely they had a pinhole camera, nor would they need one. They had Barry West there, for starters. They also had Fabiani, contractually obligated to keep them informed. In fact, Rossi has written many times that Fabiani was their “man.” It’s a great example of how to lie with the truth, it’s done all the time. Much sound and fury signifying nothing. A “Certificate of Interested Parties” is a tool that a court uses to avoid conflicts of interest, such as that the judge has some financial interest in the outcome (e.g. via shared ownership in a parent corporation of one of the parties to a suit). There is NO conflict with the self-certification by JMP on the license agreement. As others have noted, an ‘entity’ does not necessarily mean a corporation. Well, “NO” conflict is an exaggeration. 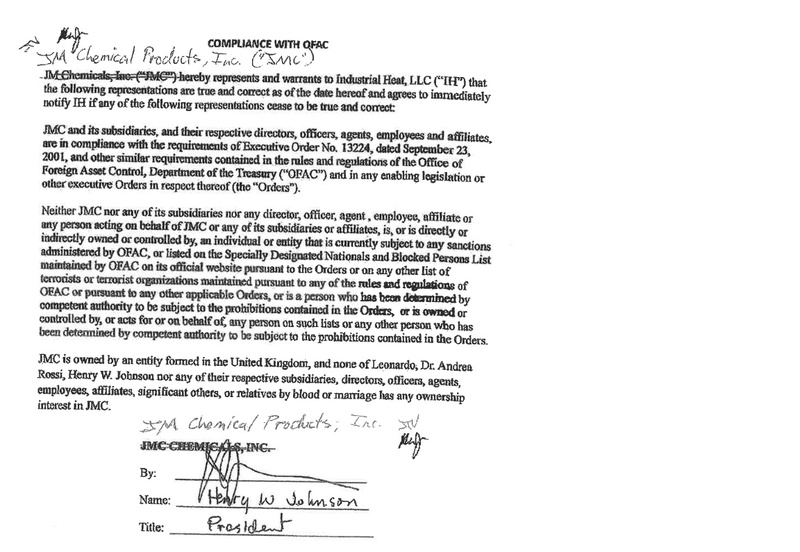 First of all, this self-certification — which, I repeat, was not part of the License Agreement — was part of a set of representations to IH implying a corporate parent in the U.K., specifically Johnson Matthey. From the disclosure, we now have a strong implication that there was no corporate parent, then or now, and the owner was not a “U.K. entity.” The owner was, in fact, a trust with Johnson as trustee, such that Johnson exercised the full powers of an owner. This is quite different from what was implied. The sequence of incorporation, description of the customer as a chemical manufacturing company, formation of the trust as what is now the apparent owner, and then the agreement with IH, all very quickly … and followed quickly by the move of the Plant to Florida, shows that the chemical manufacturing company was a myth, a sham, and at best an idea or plan. Created by Johnson and Rossi. Another lesson for all of us to stop jumping to conclusions. If my memory is correct it was us on these forums that made the connections and we have some how turned our guess work into fact? and then have the audacity to be angry that we are wrong?. Even now the relationship with JM Products is unclear. Our best case would be to watch events unfold without jumping to more conclusions until we have a clear picture. I’m always amused by those who say, essentially, we are ignorant so we should shut up, who then don’t shut up, but tell others what they should do. Jackson has not defined what “relationship” he is talking about. He might mean the relationship between “JMC” and “JM Products.” However, that’s clear. J.M. Chemical Products was formally renamed to J.M. Products in September, 2014. See the history of JM Products and the name change. I do have some sympathy with the idea here about ignorant discussion, but the basic problem is that when discussion takes place within a self-selected community with a particular bent, various ideas get stated that are consistent with the general opinions of that community, that are then remembered and later asserted as fact. Very human. I think it was January 17, 2011, when I first saw people jumping to conclusions. Akin’s Laws of Spacecraft Design. Nice. And after 6 years what does your analysis of available data suggest? Truth theory consistent with data, scam theories have thus far run into inconsistencies. What data is Pekka looking at? What does “truth” mean? Is it true that Rossi is a fraud, or is it a scam that IH tried to foist on Rossi to steal his IP? What data “suggests” to us is typically what we already believe, because we select and filter data to consider according to our preconceptions. It’s difficult to move beyond this, but that is the core of the scientific method. I would suggest that Pekka is not looking for evidence that, for example, Rossi routinely lies. The lawsuit evidence is full of such, and to deny it requires Rube Goldberg stretches. The usual “inconsistency” that scam theories run into is based on an assumption that “he’d have to be crazy to try to pull this off!” — therefore there must be some other explanation. Yet human beings can be crazy, it’s not uncommon at all! That he could be crazy doesn’t mean that he has nothing, and the idea that it must be one (all truth!) or the other (all lies!) is an obvious distortion of the full realm of possibilities. Crazy people can be right about this or that, and sometimes they are so right about something that it drives them crazy, or pushes them over an edge, the classic example is Ignaz Semmelweiss. Dr.R has been honest as possible and i have been around and seen a mountain of data and papers, patents, post,videos ,books. For years and he has always kept thing above the board. He is a great scientist and inventor. Hilt in the highest regard by many many very well known men of science. From what clovis has written elsewhere, he is not interested in, ah, investigating truth, because it might hurt his hero’s chances in court. It won’t. What we write on these blogs will have very little effect on Rossi v. Darden. It might have some effect, not necessarily a large one, on what happens when Rossi v. Darden is resolved. However, in case he or someone else cares, I recommend reading 0029-12_exhibit_12 Rossi email September 10, 2012 re Hydro Fusion — the email from Rossi to IH about the Hydro Fusion test in 2012, and then reconsidering “above the board,” or “above board” which would be colloquial English. If one has access to it, there is coverage of that incident in Lewan’s An Impossible Invention, pp. 243-249. Someone is lying about something, and Rossi essentially claims in the email that he was deceptive, and he calls that a “masterpiece” in Exhibit 13. For the IH complaint paragraph about these emails and Rossi’s response, see paragraph 66 in Rossi Answer Merge with IH Claims. If those emails were inauthentic, he would have said so. There are still supporters of Rossi who excuse his actions, but fewer and fewer who write like clovis has written above, which is face-palm denial. June 24, Johnson incorporated J.M. Chemical Products. with only himself named. July 5, Rossi suggests rental of the IH Plant to this company. July 14, the Platinum American Trust is formed, with Johnson as Trustee and Francesco Di Giovanni as beneficiary. From the disclosure, it appears that PAT is the putative owner, there is no other (other than Johnson). July 28, a Confidentiality Agreement was executed between IH, and JMC. August 13, the “Term Sheet” is created, an agreement between IH, Rossi, and Johnson on behalf of JMC. While there are other possibilities, it is highly unlikely that a trust formed in the United Kingdom would have a Florida attorney as trustee. How important is this? It is a piece of circumstantial evidence that indicates that JMC (name changed to J.M. Products in September) was not an operating chemical company, but was set up specifically to create the Doral demonstration or test. IH alleges in paragraph 74 that the certification was false, see http://coldfusioncommunity.net/rossi-answer-merge-with-ih-claims/ and you can see Rossi’s answer there. Let’s see, anything to critique here? Funny, no, I wrote that three days ago and haven’t yet noticed a problem. 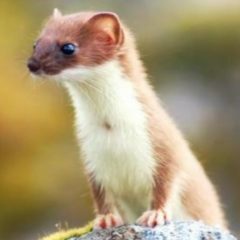 But I can thank Frank Acland for approving it, as he has approved well over 99% of my posts, including some, recently, with links to coldfusioncommunity.net. I will probably be adding more as I have specific pages here of possible interest to ECW readers. That link is a great read. The “point/counterpoint” format really brings the competing claims to life. Thanks. It was a day’s work. I also compiled a Merge document for the Rossi Complaint and IH Answer, see http://coldfusioncommunity.net/ih-answer-merge-with-rossi-claims/ and these Merge documents include links to relevant Exhibits. Comments and especially corrections are welcome. I had realized that without this kind of merged document, it was ridiculously difficult to understand many of the Answers. So … I created them to make it much easier. It might be the case that J.M. Products, Inc. initially had a parent company that was formed in the United Kingdom but that the parent company has been dissolved and that J.M. Products, Inc. is now independent. It was apparently owned by the declared trust from the beginning, it looks like the trust was formed to be the owner, giving Johnson total defacto control. It will be maybe a month before we see Johnson’s Answer. This is not about popping a balloon with a pinprick. Unless you already fear that the Doral test is a balloon. How relevant is the “owned by entity” statement? Rossi’s attorney’s could simply claim that Rossi made an error (unless there is another explanation). It would not be the first time a “Rossi-ism” was put in writing. It would be difficult to prove that it was an intentional misrepresentation. It’s part of a pattern. First of all, this wasn’t Rossi, it was Johnson. Rossi supported it, for sure, but the statement was by Johnson. That it was included with the Agreement, Exhibit B, though it was executed two years later, was pointed out as an error by me, I don’t know when, it may have been six months ago. But users have not necessarily read old discussion. This error was perpetuated by Acland’s post, though. Just the other day, I separated out the declaration from the Agreement, so that it may be separately linked. It had nothing to do with the Agreement, except it probably ended up in the same file folder in Rossi’s possession, with his marked up Agreement. Funny, maybe I’m superstitituous, I would not mark up a $100 million Agreement. I’d immediately make a copy and mark that up if I wanted. I’d keep the original under lock and key. And, of course, I’d take it to an attorney and get advice on all the ins and outs of it. But I’m obviously not Andrea Rossi. And in any case it would be ludicrous for IH to claim that one such misstatement is evidence of a general intent to commit fraud, or that the entire contract should be nullified because of that single point. A pattern of “misstatements” can show intention to commit fraud, and no pattern can be shown without showing, first, one example. In fact, IH, legally only needs to make the claim, and they must assert that some kind of evidence exists. That could be purely verbal, by the way. Rossi has no evidence of intention to commit fraud on the part of IH, other than what he claims they told him. Claimed verbal evidence, and I was a little surprised that much of the suit wasn’t thrown out over the Statute of Frauds, which, BTW, doesn’t have to do with frauds but with preventing weak fraud claims, years later, based on alleged conversations that might be poorly remembered or even imagined as self-justifying inventions. Under some circumstances, even one misstatement, established, could evidence fraud. However, this particular point would not be enough, by itself, to “nullify a contract,” and IH has not attempted to nullify the contract. Rossi has, but not in court, in court he is trying to enforce the contract. So the whole approach here is a bit confused. It is a complicated case, it’s easy to become confused. Judges look through language to see reason, reality and material interests. That particular statement is one of many elements of the overall agreement, which is an agreement on an exchange of value. It is not feasible for IH to claim that their understanding of the exchange of value hinged on that one statement. Of course, they have not claimed that. Radvar, at this point, had not read the IH complaint and the Rossi answer; his comment above about the Merge document I prepared was later. It wasn’t Rossi that claimed that, it was Johnson, in a document that Rossi (probably inadvertently) included with the Agreement in his filing. The “exchange of value” did not depend on that. However, the representation was that JMC was independent of Leonardo — and IH — (which was an element of value, see the proposal email), while the reality varied from that. This is one element among many, and the IH complaint does not hinge on it, it is merely a support. The history is documented there, showing dates,and with ready links to sources. With that knowledge, much speculation here is off. While jumping to conclusions is never a good idea, sometimes the obvious is obvious. As well, appearances matter in the real world. Note added. At this point I have no clue where I got the idea that the phrase had “individual” in it. I am looking at the document now and it’s not there. The original quotation was correct. This is a good example of how memory is plastic. I had previously pointed out that an “entity” could mean a corporation or something else (like a trust, in fact, or an individual), And then I remembered my interpretation instead of the original. Very common. Ah, well. I did this deliberately to show how I admit error quickly, it looks really good! <– This statement is a lie. But this statement is true. No, I really did, somehow, come to think that I had read “individual or” and it was apparently based on my interpretation that an individual can be an entity (which was taking it a step further than entities being other than corporations. Key, though, is “formed,” which implies a structure, not an individual, and U.K. does not seem to apply to the owner which has now probably been identified. IH does not make a specific claim as to the owner, but asserts that it is one of the parties excluded by the Johnson declaration. See the IH AACT, paragraphs 70-79. Johnson has not yet filed an Answer. We ALL tend to forget the reason for this being in court. It’s been said that Rossi offered to return the original $11.5 million in return for Industrial Heat/Darden INC rescinding all rights/claims on Rossi’s IP. It’s also been said that Industrial Heat/Darden INC counter offered with offering Rossi a substantial sum tho much less then the $89 million in the agreement. SO, this all boils down to Industrial Heat/Darden INC wanting to retain all rights to Rossi’s IP without paying the $89 million even should Rossi return the original payments involved. It seems Industrial Heat/Darden INC are willing to expend large sums of money to retain the technology IP they “Imply” doesn’t work. A Woodford representitive said it best. This is merely an IP war. People don’t fight over something that doesn’t work. If it has other issues such as reliability or just not ready for the market, you tend to negotiate those issues. (1) An alleged offer by Rossi to return the $11.5 million if IH abandons (the correct term, not “rescinding,” Rossi has attempted to rescind them) the rights. (3) Allegedly, Woodford called this an “IP war. People don’t fight over something that doesn’t work…. ” But Omega Z did not use quotation marks and it’s unclear what Woodford allegedly said and what was then Omega Z’s comment on it. As to the first, IH invested, so far, probably about $20 million, that was their original stock offering and it probably was all subscribed, and probably was all spent. $11.5 million was what went to Rossi, and a return of that would still leave IH looking at a dead loss of $8.5 million — or more. Rossi did this with at least one European licensee: effectively canceled the licenses, returning the fee, leaving them with dead losses for the work they had done, which was apparently substantial. As to the second, I would not wonder at it, if this offer was early. The whole GPT concept was badly flawed, and totally unnecessary, for many reasons. Reliability testing, yes. Of interest, thinking about reliability, the way that the alleged GPT was arranged by Rossi would cover up reliability data, since he apparently believed he could substitute reactors from the backup Plant. A test of one Plant (the contemplated GPT in the Agreement) is not at all the same as a test of two, with mix and match allowed. It seems the concept was designed to prove the reality of the effect, by being BIG. And then, by hiding the power usage, BIG was hidden, if it existed. This was a fiasco, even if the Plant really worked! Of much higher interest: tests of individual reactors, many of them, all individually documented. The goal is not to have a reactor operating, but to see how each reactor behaves, how long it works, when it breaks down, how long it will function on a fuel charge, etc. Rossi seems, in his recent descriptions of Quark-X and his chatter about sigma, to now be thinking more in this way. How about he buys the two 1 MW reactors from IH, ships them to Sweden, and starts selling heat? If it works, of course! Wouldn’t Hydro Fusion be thrilled? Such a deal could actually be made before settling Rossi v. Darden, in theory, if the lawyers are good a negotiating compromises. I’d think part of such a deal would allow IH to thorough inspect and document anything they wanted about the two reactors — since they own them anyway. Then JMP could vacate the warehouse, again, after inspection if Johnson hasn’t settled with IH. Or all this could be part of a final settlement of the cases. As to the third, I searched for a source, googling “Woodford IP war” and found none other than statements on ECW and echoes of those. The earliest mention of “IP war” in this context seems to be from … Omega Z. We become our own sources…. all too often. Woodford Investment Management said it was ‘not appropriate’ to comment on the lawsuit. ‘Industrial Heat is currently working with numerous scientists to build a diverse portfolio of innovative technology, such as low energy nuclear reactions, in the quest to eliminate pollution,’ it added. Omega Z commented in the ECW discussion of this Citywire story., in his comments now, attributed to Woodford, it appears he is quoting himself, not Woodford. That’s only what Rossi say. Dawey Weaver close to IH have denied it. So it all depends on who you trust. Weaver has made many unfounded claims and has backpedaled more then once. Dewey was just muddying the water and promoting FUD. That’s telegraphing “Planet Rossi,” specifically the Nation of Sifferkoll (though Siffer has been quiet lately). If Weaver has made “many unfounded claims” (real or alleged) I would be interested in documenting them. So far, as far as I recall, most of what Weaver has written, where we have learned fact, has proven to be reasonably accurate, if dressed up in, ah, colorful language. Weaver is an IH insider, we are utterly unsurprised to find him supporting possible IH positions. IH has not been presented with the claims Omega is making about them, repeating what others have written. So we only have what Dewey has said, as to that side. If one side is FUD, what about the other? And this is what DNI is suggesting: it depends on whom you trust. However, again, the statement from the Woodford representative out right stated this is an IP war. The reason Industrial Heat/Darden INC is in court is to retain the IP. It would be much easier and cheaper legally to claim the contract wasn’t fulfilled and revert everything back making everyone whole. Apparently Omega Z considers that alleged statement important, and he is standing on it, but I doubt that Woodford ever said that, see above. Omega Z said that, about six months ago. IH has an obvious reason to be in court: Rossi sued them, as IH, as Darden and Vaughn personally, and Cherokee Investment Partners. It is entirely unclear that Rossi offered the $11.5 million back, nor that it would make sense for IH to accept it as full settlement. It seems Omega Z must believe that if IH believes that the IP is worthless, they would surely have settled for a mere $11.5 million, but suppose what seems likely, based on the POTE at this point, the IP actually is worthless and the Plant did not function and the probable $20 million or so that they spent went down the drain. Seems to me they might want more than $11.5 million and, because of the fraud issue, they can go for triple damages. My guess is that Johnson has money, as well, he may be an inviting target. Omega Z is reasoning from an assumption that the Plant actually worked and IH is lying about the whole affair. Rossi went for $89 million and triple damages, and did not only go after IH, and now plenty of evidence is coming out. A settlement is possible, but it probably will not be as favorable to Rossi et al as would have been the status quo had Rossi not sued. IH might have walked away. Rossi could have moved his property to Sweden and proceeded full speed ahead, if he has real technology, and the details could have been worked out later. Instead, he is buried in 3 TB of data plus 100,000 pages of discovery documents, and a complete mess on his hands. One doesn’t have to like what DW says, but it would be wise to pay attention to what he has said so far. It is not mud or FUD, despite how much it may not appeal to many people. He has disseminated about 90% now-verifiable correct information. With some big reveals that have yet to surface, but at least one that is is briefly mentioned in the recent IH et al filing. I’ve been wondering when the rest was coming. If I were IH and suspicious about Rossi’s activities in 2015, I would have done things like have someone outside the Doral facility keeping track of how many truckloads of reagents and products were being delivered and taken away each day, take a photo over the wall of the famous customer’s site just to see what’s there, do a bit of IR photography (as I think was briefly mentioned in one of the recent IH filings) from a drone high atop the facility to try and locate just where that 1 MW of missing heat has gone, and so on. I’m hoping whatever was done will come out. Also, it is my hope that the entire Doral facility is still under lock and key and in IH’s control. That could be interesting too. Like viewing the body ready for autopsy. IH may have done some of these things. We know that they were objecting to the idea that the Doral plant was a GPT with Penon as ERV, at least formally by the beginning of December. A drone with an IR camera would be cheap, and a helicopter carrying the same not prohibitively expensive. That place should have been lit up brightly in the IR with a megawatt — or even with 100 KW. Dewey, I believe it is, has said that the Plant is padlocked, with two padlocks, one from IH, one from Rossi. There has already been some possible spoliation of evidence, with Rossi removing the fuel and Penon removing his instruments. The Doral facility is (or at least was) being rented by JMP, so IH can’t really keep the facility under lock and key. The containers, sure, they could be locked up. But I would expect that JMP would want the containers out of there so they can either move their factory stuff out, or get back to manufacturing with natural gas power (or whatever). Aw, there isn’t any chemical plant, almost certainly…. the layout of the plant was such that moving materials and product in and out would be difficult, it would have to be through the front door or that small door in the back of the “customer area.” This is so friggin’ obvious…. they had to be crazy to think this would work. Pure ad hominem libel. No example of whoppers provided. So WTF is Omega Z? Darden and Vaughn are trusted by people with money, lots of it. Woodford obviously trusted them with their $50 million — and knows that this is being spent and that there will be no fast return, if there is ever any return. They are also trusted by the CMNS community, in whom they are investing. That community is not giving them money, it’s flowing the other way. And that is what Woodford actually said, not the apparently twisted version presented by Omega Z. They are investing in research. And Rossi hates that, apparently. Truth is always a cause of joy. If it isn’t, it isn’t the full truth, or one is attached to error. In my world it’s Rossi who have made many unfounded claims. So as I said it all depends on whom you trust. Hence I think it’s important to write were the information come from. If you want to always write the truth, then quote and attribute. “According to …” and then be accurate. You will still make some mistakes, but they will be obviously that, if you are at all careful, because people can check your writing, and some of them will be kind enough to correct you. As well, if opinion is stated as opinion, and it is actually your opinion, it is the truth. That is, it actually is your opinion! Basic ontology. Don’t leave home without it. Dardens and Deweys of the world are Venture Capitalist. Plenty. Again, WTF is Omega Z? This resembles Rossi’s long-standing paranoia. He refused corporate help in Italy, blew them off, and when faced with severe challenges, he didn’t have the resources and support he needed. And that idea is charitable, assumes he really had a waste conversion technology, etc., and was not actually a fraud. IH took over the Ampenergo license, and apparently paid Ampenergo millions of dollars for that, which was otherwise Rossi’s responsibility. Venture capitalists are those who provide venture capital, which entrepreneurs typically need. So there is a deep paranoia expressed here, that all “venture capitalists” are vultures, out to screw honest inventors over. Yet if we look at the history of IH and Rossi, if there was screwing over going on, it’s in the other direction. Rossi took $11.5 million. So, he hasn’t gotten $89 million, and there is a lawsuit to determine if he is owed that. That’s being screwed over? Rossi was completely free to develop and sell his technology in, say, Sweden, his obligation to IH only began to be their chief scientist in 2013, with the delivery of the Plant, and was for one year. Nothing stopped him then from carrying on elsewhere. Except, perhaps, his own greed, which is what it’s looking like at this point. Or if it was all fraud (or what is effectively the same, insanity) from day one, which is not impossible. What about opinions about stating opinions? …and a few more dribbles followed.